Small group scuba dive tour outside world famous Waikiki Beach! 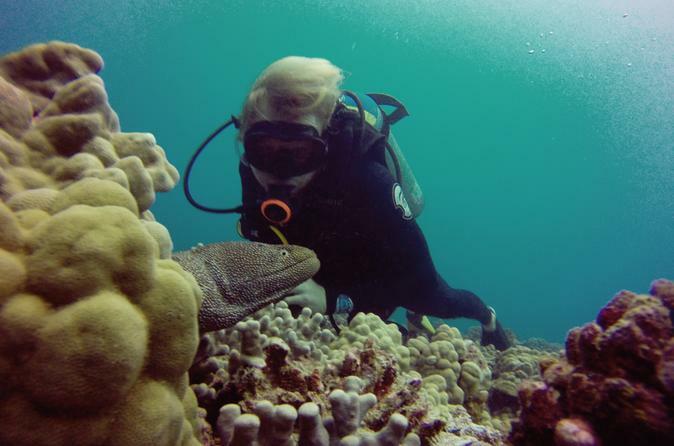 Enjoy amazing reefs, abundant Hawaiian marine life, and great views of Honolulu! Its in the name! As many as a dozen green sea turtles can been seen together here. Take a knee and watch one of the busiest turtle cleaning stations on the island. Several at a time gather to have their shells cleaned by tangs, wrasses and other fish. The turtles are used to divers, so getting a photo with one is usually easy. Don't touch though, these guys are protected by law. Another south side double whammy! Horseshoe reef gets its name from its shape. Here you can find several species of eels, pincushion starfish, and antler coral. Swim 50ft/15m to Kewalo pipe. Keep your eyes peeled for spotted eagle rays off in the distance, and follow along this drainage pipe covered in coral and little critters galore.